When I woke up Thursday morning I had an extreme itch to get out of town and see a bit of nature. 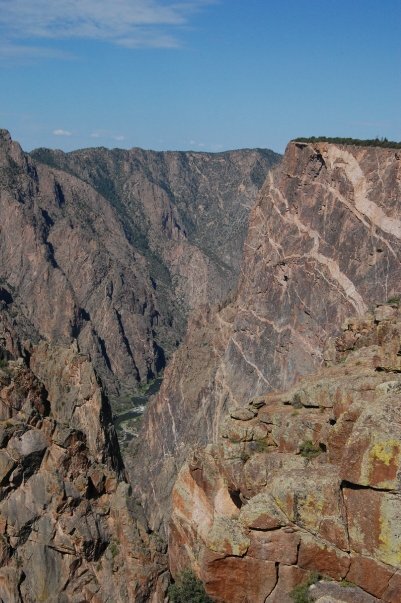 I had been interested in seeing The Black Canyon of the Gunnison for a while so I decided to head southwest. 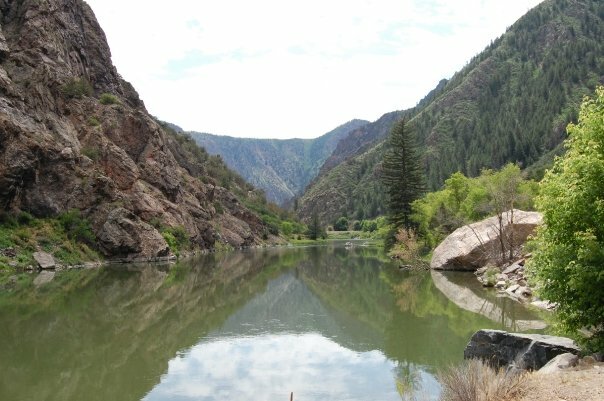 The Black Canyon is about a four hour drive southwest of Denver and sits just in between the towns of Gunnison and Montrose, Colorado. So, after a quick shower, I through some things in a bag and hit the road. And as I was driving along U.S. Highway 285 out of town, I realized that in the eight years I’ve lived in Colorado, I had never driven that road before. Heck, I had never even been anywhere in the state overnight. I had taken lots of trips to places like the Sand Dunes and Rocky Mountain National Park, but never anywhere overnight like this one. Because of this, I’m glad I decided to bring a journal and start writing about my local travels as I have my international ones. When I arrived in Gunnison I checked into one of the first hotels I found, dropped off my stuff and headed on over to the canyon to see if I could get a peak in before night. What I didn’t realize when I decided to make this late afternoon trip was that the canyon itself doesn’t start until you hit Blue Mesa Dam, which is about halfway into the park and in between Gunnison and Morrison. 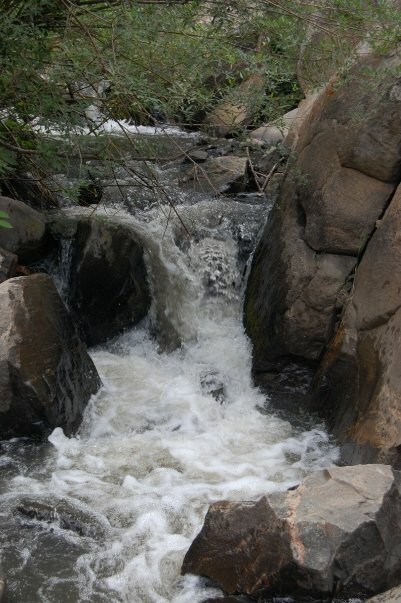 The park actually starts with a series of lakes and reservoirs that go through a dam before going down into the canyon and creating some absolutely gorgeous scenery. I walked down a short trail and saw a really cool waterfall as well as the canyon from below…which is quite a ways up with walls around 2,200 feet high. On the second day I woke early and went to check out more of the canyon by doing some hiking and a drive along the south rim. Unfortunately, just a couple of hours into the day, I began to feel a bit sick and quite tired. I’m not totally sure what was wrong, but something tells me heat exhaustion was the culprit. I was able to do a three kilometer hike to Warner Point and back, which is the highest part of the canyon at around 8,200 feet above sea level, and has a lot of up and down to the trail…most of which is right along the edge of the canyon or on a very steep slope leading to the edge. I also made a few other stops along the drive and did some short hikes of about 500 meters, to see things like the Painted Wall (left), but nothing terribly serious. After I was done driving the south rim though, I took the drive down to the bottom of the canyon from the entrance to the park. The whole way down to the Gunnison River I kept laughing to myself at the thought of my sister-in-law along with me on this trip. She hates heights and this, I think, would’ve made her scratch and claw to go back up to the main road. The road down is on a 16% grade and has no guardrails as it drops from around 8,000 feet to around 5,700 feet above sea level. The road is no wider than a bike path for each lane and has only two pull offs, neither of which are conveniently located if your brakes go out. It was nice to go down to the bottom of the canyon and snap a few photos, but by this point I wasn’t feeling terribly well, probably from my Warner Point hike, so I decided to head back up pretty quick on go on into Montrose for some much needed gas and a late lunch. The rest of the day was still mine and I had an idea to stop somewhere else in Colorado before heading back to Denver, and work, on Saturday. But, after a nice scenic byway detour over the Grand Mesa in Mesa County, I decided to head on back to reality. I think the Grand Mesa, and many other locations, will be in my future, but not this weekend. I was able to get a quick “bio break” in and get away from things for a night and that was good enough for me. For now that is. There’s definitely going to be some more road trips in my very near future now that I’m supposed to be working four on and three off at work. But where to go next…that’s always the question.